Here are some snazzy birthday facts about 29th of December 1978 that no one tells you about. Don’t wait a minute longer and jump in using the content links below. Average read time of 10 minutes. Enjoy! What day was my birthday Dec 29, 1978? December 29, 1978 was a Friday and it was the 363rd day of the year 1978. It was the 52nd Friday of that year. The next time you can reuse your old 1978 calendar will be in 2023. Both calendars will be exactly the same! This is assuming you are not interested in the dates for Easter and other irregular holidays that are based on a lunisolar calendar. There are 251 days left before your next birthday. You will be 41 years old when that day comes. There have been 14,724 days from the day you were born up to today. If you’ve been sleeping 8 hours daily since birth, then you have slept a total of 4,908 days or 13.44 years. You spent 33% of your life sleeping. Since night and day always follow each other, there were precisely 499 full moons after you were born up to this day. How many of them did you see? The next full moon that you can see will be on May 18 at 21:13:00 GMT – Saturday. Fun stat: Your first one billion seconds (1,000,000,000) happened sometime on September 6, 2010. If a dog named Praline - a Welsh Springer Spaniel breed, was born on the same date as you then it will be 200 dog years old today. A dog’s first human year is equal to 15 dog years. Dogs age differently depending on breed and size. When you reach the age of 6 Praline will be 42 dog years old. From that point forward a medium-sized dog like Praline will age 4.5 dog years for every human year. French Revolution: The Assembly of Notables is convened. Wounded Knee Massacre on Pine Ridge Indian Reservation, 300 Lakota killed by the United States 7th Cavalry Regiment. The Irish Free State is replaced by a new state called Ireland with the adoption of a new constitution. KC2XAK of Bridgeport, Connecticut becomes the first Ultra high frequency (UHF) television station to operate a daily schedule. An Eastern Air Lines Flight 401 (a Lockheed L-1011 TriStar) crashes on approach to Miami International Airport, Florida, killing 101. A suicide bomb attack at the Volgograd-1 railway station in the southern Russian city of Volgograd kills at least 18 people and wounds 40 others. What does my birthday December 29, 1978 mean? 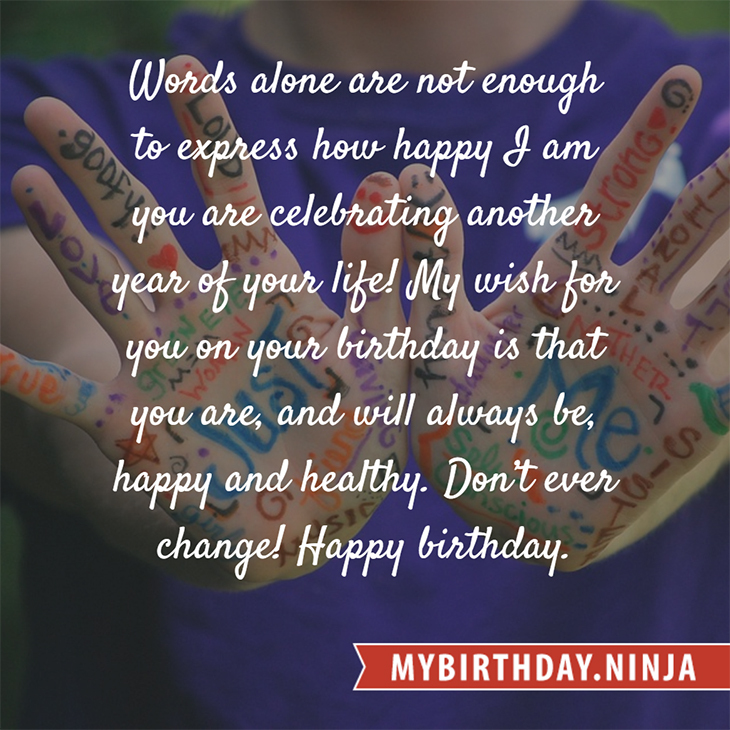 Your birthday numbers 12, 29, and 1978 reveal that your Life Path number is 3. It represents vision, imagination and joy of living. You possess a great talent for creativity and self expression. The following celebrities also have the same life path number: Christina Aguilera, Torquil Campbell, Haifaa al-Mansour, Sara Lumholdt, Mary Ann Mobley, Cécilia Rodhe, Lisa Marie Varon, Cris Judd, Tina Barrett, Wayne Fontana. 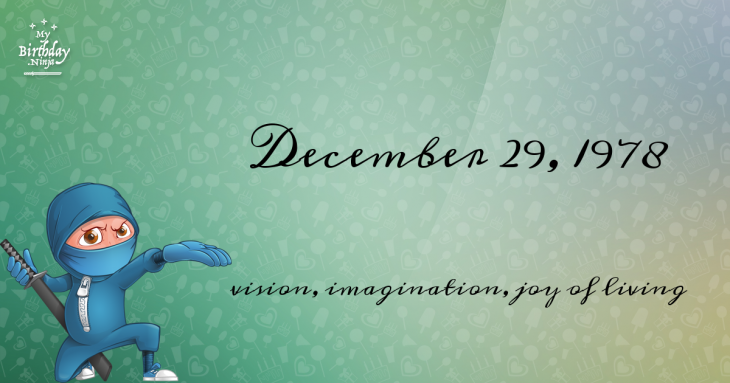 What is the birthday horoscope for Dec 29, 1978? The Western zodiac or sun sign of a person born on December 29 is Capricorn ♑ (The Sea-goat) – a cardinal sign with Earth as Western element. The ruling planet is Saturn – the planet of discipline. According to the ancient art of Chinese astrology (or Eastern zodiac), Horse is the mythical animal and Earth is the Eastern element of a person born on December 29, 1978. Fun fact: The birth flower for 29th December 1978 is Holly for precious moments. What is the Love Match for Dec 29, 1978? When it comes to love and relationship, you are most compatible with a person born on December 19, 2005. You have a Love Match compatibility score of +109. Imagine being in love with your soul mate. On the negative side, you are most incompatible with a person born on May 12, 2002. Your incompatibility score is -144. You’ll be like a cat and a dog on a love-hate relationship. Arf-arf, I want to bite you. Meow-meow, stay away from me! The number-one hit song in the U.S. at the day of your birth was Le Freak by Chic as compiled by Billboard Hot 100 (December 30, 1978). Ask your parents if they know this popular song. I do not know how you feel about this, but you were a female ♀ in your last earthly incarnation. You were born somewhere around the territory of Southern Japan approximately on 1850. Your profession was digger, undertaker. How many babies were born on December 29, 1978? Base on the data published by the United Nations Population Division, an estimated 122,638,528 babies were born throughout the world in the year 1978. The estimated number of babies born on 29th December 1978 is 335,996. That’s equivalent to 233 babies every minute. Try to imagine if all of them are crying at the same time. What is the popular baby name on 29 Dec 1978? Here’s a quick list of all the fun birthday facts about December 29, 1978. Celebrities, famous birthdays, historical events, and past life were excluded. Try another birth date of someone you know or try the birthday of these celebrities: August 24, 1924 – Alyn Ainsworth, English singer and conductor (d. 1990); June 8, 1947 – Julie Driscoll, English singer and actress (Working Week); May 19, 1993 – Ryunosuke Kamiki, Japanese actor.